New Year Resolutions. How many of us actually keep them? I mean, how long is a resolution supposed to last? An hour, a day, a month, a year, our whole lifetime. Just seems pointless to me. So years ago I made a resolution never to make resolutions and so far I’ve managed to stick to that resolution. But if I was going to make a resolution it would have to be something to do with photography. Maybe master Hyper-Focal Distance without the use of an App. Perhaps make my photographs conform to the Golden Rectangle Ratio. Or, what about the Sunny 16 Rule? Should I be sticking to it? However, on my photography to-do list for 2013, is an entry to try to photograph far more wildlife than I did last year. Also on that list is blue-hour and macro.. Resolutions, definitely not. Hi Mike. 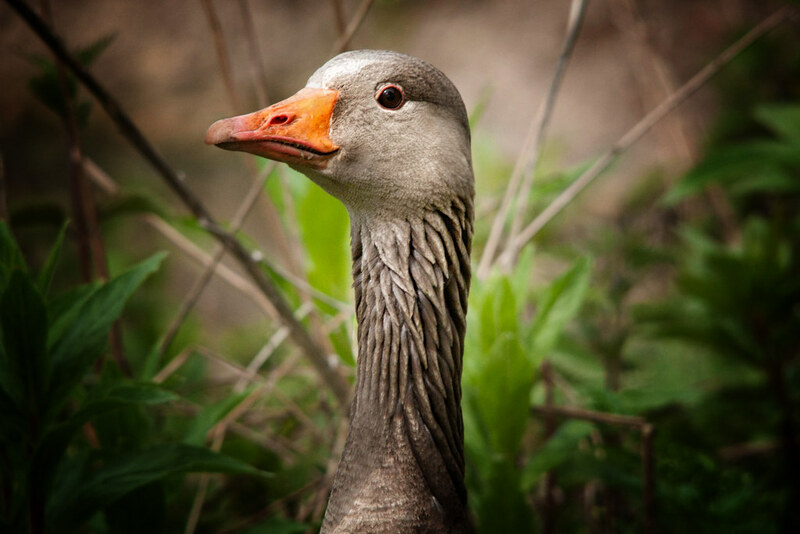 Nice portrait, looks like a Pink-Footed Goose. You could say, it fits the “bill”. I for one am glad you are going to be putting in some more Wildlife this year. Cheers. Hey Steve, remember I don’t do resolutions, might be on my list, but…..
You’re welcome. Thank you for the comment and I hope you’ll like what you see. Seems our non-resolutions are in the reverse, you with more wildlife and me with more people. Hope 2013 is the best for you. Nice Photo. Looks like he is saying, I see you watching me. I knew it. Great photos take time and patience. I see strength of resolve here Mike in this fine creature sticking its neck out for a glimpse into the New Year. Always look fwd to seeing your great shots. Best wishes from a fellow non-resolution maker. Very nice. I shot some photos of these last summer. They’re pretty easy to shoot compared to many other birds, because they’re not so shy and the move rather slowly. I agree with you on the resolutions. If you want to make resolutions, or if you want to change anything, you can do it whenever you feel like. There’s no need to follow a calendar.. Thanks for the pingback! I appreciate it.